They leapt to the dais upon which the altar sat, feet booming on the planks and calling an abrupt end to the ceremony. Dutch took the full force right in his legs, landing behind the rat priest, while James rolled, drew himself up, and scooped up the kid. With his other hand the younger man swept the room with his gun, waiting for one of them to try something. Dutch threw his free arm around the priest’s neck in a tight grip and flashed iron before its eyes. He pressed the barrel of his gun to the rat’s temple, painfully shoving its head sideways into the crook of his elbow. Dutch felt the rat swallow thickly. He grinned. “You know what this is, yeah?” Dutch asked it. The rat took a grip on Dutch’s arm and began shrieking at the crowd. James took out some extra earplugs, made of a kind of waxy putty, and fitted them into place. Gunshots at this distance would most certainly blow out her eardrums, and they didn’t want to bring the kid back only to have her have to learn sign language because they got careless. James rewrapped the little girl in her blanket, being sure to cover her head, and cradled her in the crook of his arm, holding her tight to his chest. He’d be damned if he’d let anything happen to her, now that she was under his protection. Just hold on, young’un, he thought, we’ll get ya outta this. They made their way off the dais, walking slowly, Dutch practically dragging the rat priest. He kept the gun pressed to its head, and it made no move to escape. James walked ahead, sweeping the crowd. The gathered vermide spat and hissed, but made no move to stop them, not even the big were-rats guarding the archways. They made it to the door of the chapel without incident, but Dutch noticed that the crowd had begun to filter into the aisles, following them slowly at a safe distance. They made their way in this fashion through the makeshift town, James leading the way but staying very close to Dutch. By the time they got to the pipe they’d entered the town through, they had amassed quite the following. It seemed like every rat in town had turned out. Dutch and James were beginning to sweat. They didn’t know how long they could keep this up and Dutch certainly wasn’t about to drag this rat back through the sewers with them. It looked as though that fighting retreat was about to become more than just a backup plan. James didn’t need to be told twice. He tore off down the pipe back the way they’d come, praying to God that he didn’t run into any vermide patrols or raiding parties. His gun was slung, bouncing off his hip as he ran. He came to the body of the were-rat, leapt it, and that was when he heard the gunshots. Not pausing, he poured on more speed in a desperate attempt to get the kid to safety. That was his first priority. After that, he could run back and help his boss. He sent another quick prayer for Dutch’s safety as he ran. Dutch had gotten about two feet into the pipe when the rat priest shrieked, and heard the answering shout from the gathered throng. He knew that he wouldn’t be able to match James for speed with his rib broken. The rats were faster than humans anyway. Now it was his job to slow them down to give James enough time to escape with the kid. At about ten feet in, he turned and opened fire, desperately holding the front grip of the gun to keep the muzzle trained on the opening. The rats were pouring in. He couldn’t kill them fast enough. Eventually the magazine was empty. Dutch had done this a thousand times, and could reload this gun in seconds flat while blindfolded. New magazine locked, he charged the mag and opened fire again, still frantically backing down the pipe. He paused when he reached the body of the were-rat, reloading again. He didn’t want to get run up on with only a quarter-full mag. He was breathing heavily. His chest was on fire. He pricked up his ears. He didn’t hear anything coming down the pipe after him. Maybe they gave up, he thought. The side passages! He turned just in time to drop as a massive furred fist nearly drove his head in. It was another were-rat, and this one had backup. As he fell to the floor, preparing for the impact on his cracked rib, he raised his gun and let fly, filling the pipe with smoke and the roar of gunfire. Holes tore the thing’s chest and it cried out, falling back. This gave Dutch enough time to clamber to his feet. The creature had recovered as well. Dutch took careful aim and put a round through its head, dropping it to the floor. Behind it there was another horde of rats. Dutch had to pray that he had time to reload. He also prayed that James would return in a glorious cavalry charge to save him. God knew that he could use someone to pull him out of the fire right now. He fired and fired, then the barrage stopped as his gun clicked. Then they were on top of him in a shrieking, biting, clawing mass of fur. He dropped the gun and went for his knife. If he couldn’t shoot them, he’d open them up and start pulling stuff out of them until either they stopped, or he did. Jaws clamped around his arm, biting through his trench coat, and he stabbed the rat through the head. He shook the body loose and another rat jumped at his chest, bowling him over in a mass of fur and claws. He stabbed until it sagged lifeless, getting scratches along his neck and face for the trouble. One more leapt on him, but he managed to see it coming and got his knife in the way of its chest. It was dead before its claws landed uncomfortably close to his eyes. There were more coming, he knew. He could hear the squeaking and running in the pipes. Only a matter of time now, he thought. Picking up his gun and reloading, he started back, much slower than he had been. There was pain in his foot. Crap, he thought, it’d be just like me to warn the kid about spraining his ankle, then go and break mine like a damned fool. He hobbled along, hoping to God that they didn’t know which direction he’d taken. He would have no such luck, though, as he heard another party of the creatures coming up behind him. Fine, he thought, if this is how I go out, I’m gonna take as many of them down with me as I can. 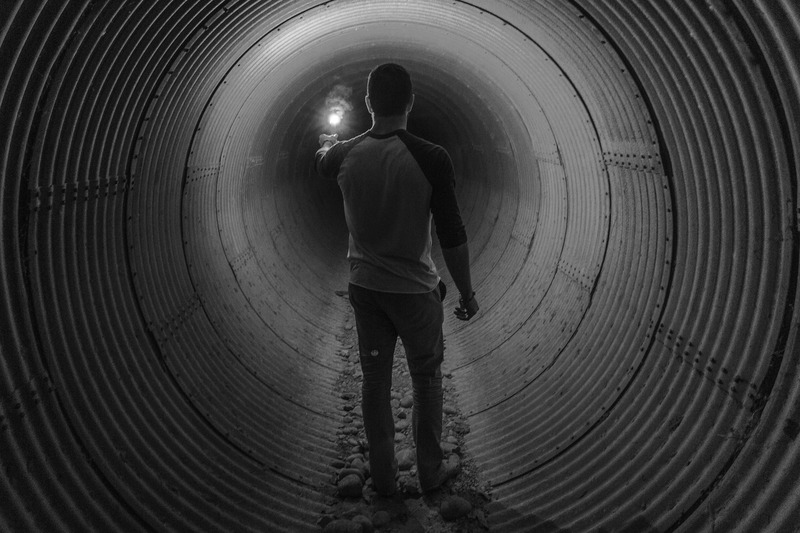 He turned and waited, hands shaking and eyes scanning the darkness of the tunnel. He tested his ankle and it didn’t seem to be broken, but he definitely couldn’t run anymore without help, which didn’t appear to be coming. Out of the black they came. A horde of claws, teeth, and fur, screaming for his death. He was about to open fire, when he felt a hand on his shoulder. Dutch, shocked but used to adapting to new situations, nodded and jogged along the corridor as fast as he was able. He heard James shouting and firing down the pipe, staying close to his back. Eventually they made it back to the in-use part of the sewers and the ratmen began to retreat. Angry as they were, they understood that drawing unwanted attention down here would expose them, and having two humans firing guns in the sewers would definitely draw unwanted attention. They would have to settle for vengeance when the time came. At last the two made it back to the ladder leading to their SUV and began the laborious task of climbing. Laborious for Dutch, at least. He could only properly use one foot and so climbed up just using his arms. James marveled at his strength, knowing that he probably wouldn’t have been able to do that. Definitely not with a broken rib. I guess being ex-military has its perks, James thought. Finally they were out on the street. They had a short amount of time before the police showed up, so they stowed the guns first of all. In the event of being questioned by the law, the less they saw the better. James gathered up the traffic cones and caution tape, and at last they had everything packed away. Dutch stumbled around to the passenger door and hauled himself in. He reached over and killed the emergency lights, then leaned back and relaxed at last. James pulled a blanketed bundle out of the backseat and put it into Dutch’s lap before taking his place behind the wheel. He turned the key and soon they were cruising out of Charleston on I-95, heading back to HQ. Looking over, he saw Dutch cradling the baby, having taken out the earplugs and attempting to clean the grime off the child’s face. “Yeah, and imagine them giving the cops our license plate number and a high speed chase through the countryside. Stick to driving, kid. We’ll be back soon enough." James thought for a moment. “Valerie’s gonna be really mad,” he said. “What else is new?” Dutch countered. They laughed as the SUV rumbled over the highway, taking them back to Scarborough Headquarters and the end of the mission. It's just a story right? Not based on true events?